The Steelmen went into the clash with the bottom markers on the back of three games without a win. But they ended that blip in emphatic fashion as Jordon Crawford hit a hat-trick while Joel Carta and Steve Diggin were also on target. And Robinson was pleased to see things that the squad had worked on during the week pay off on the pitch. “It was a really good performance,” the assistant-boss said. “We have been waiting for that from Jordon, it finally came and we couldn’t be more happy for him. “It’s happened at Steel Park, which is great for him, and as a team we have been working on things in training and it came off for us. “We got out of the blocks, we moved the ball really well, the three boys in midfield were the best they have been for a while and collectively, as a team, I thought we did really well. 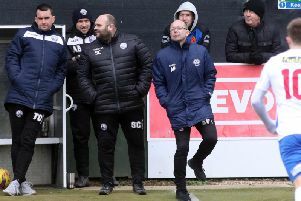 Corby’s win ensured they stayed within six points of Evo-Stik League South Division One Central leaders Bromsgrove Sporting ahead of a showdown between the two teams in the West Midlands next weekend. It’s a top-of-the-table clash that is set to attract a big attendance and Robinson is already looking forward to another huge game in the battle for automatic promotion. “We will be in on Tuesday and Thursday and we will be working on a few things,” he added. “Every game is big coming up to the end of the season now, we need to do things right on and off the pitch.